On NBC's "The Doctor's" we explain plantar fasciitis and perform three advanced procedures for pain relief before a live audience. The plantar fascia is a thick ligament that connects your heel to the front part of your foot and supports your arch. When these ligaments become inflamed, the inflammation causes heel pain and stiffness, that's plantar fasciitis. Plantar fasciitis is so common and has so many causes it often takes a doctor to work through the true underlying cause of the pain and the proper treatment. Too often we see patients who have not received satisfactory relief because previous doctors didn’t seek out the root cause of their plantar fasciitis. Sharp or “tearing feeling” pain in the heel with the first few steps when they get out of bed or after sitting for an extended period of time. The pain may decrease as the tendon loosens up but almost always returns. X-rays evaluate the alignment of the foot and check for heel spurs or stress fractures of the heel bone, both possible causes of heel pain. Ultrasound allows for complete real time imaging of the plantar fascia while the foot is moved into different positions. Doctors can then measure the thickness within the plantar fascia and any associated possible scar tissue formation or microscopic tears in the fascia. Our dedicated foot and ankle MRI is designed so the patient is comfortably seated during the scan and only the foot and ankle are placed inside the machine. It is not common to require an MRI for heel pain. However in the rare, chronic case that does not respond to conservative options, an MRI may be ordered to check all structures including the fascia, tendon, ligament, bone, cartilage and joints of the ankle and foot for a more complete evaluation. Neurosensory testing (a non-painful nerve examination) is used when there is a burning, tingling, radiating, or shooting pain in the heel. The nerves on the arch side of the ankle and heel can become irritated and painful causing heel pain. This is often missed and needs to be carefully considered if radiating pain is noted. Conservative care, usually our first line of care, when properly matched to the patient has a very high success rate. Over 70% our heel pain patients find relief with physical therapy, orthotics and shoe change. Less than 5% need advanced treatments and less than 2% require surgery. Stretching your lower leg muscles and plantar fasciitis will relax the tight muscles, reducing heel pain, especially when done prior to getting out of bed in the morning. In addition, a physical therapist can determine the correct stretches for you that will strengthen muscles, improve foot mechanics and reduce stress on the foot. At UFAI, our physicians work closely with our on-site physical therapist, offering advanced protocol for successful physical therapy treatment. Rollingyourfootonaforzen water bottle massages the fascia, relieving pain and reducing inflammation. Icing is important in the treatment of plantar fasciitis, especially after activity. Icing will reduce swelling and pain, allowing the tissue to heal faster. Combining ice and massage (rolling the bottom of your foot on a frozen water bottle) is very helpful. It not only brings some pain relief and a reduction in inflammation, it also helps stretch the plantar fascia. This too should be done several times each day. Heat can be very helpful during the physical therapy period. The heat is applied to the region of pain, which increases blood supply to the region and also warms up the fascia prior to therapy. It’s important to note that ice is the main treatment used for recovery and more helpful than heat. Adding support to the arch of the foot through an over-the-counter shoes insert or a custom orthotic insole device (which provides more accurate support) will greatly help support the foot and decrease stress on the arch. We recommend stiffer soled shoes. The upper can be soft but the sole needs to be stiff and a little lift is okay. Women do well with wedges and men do better with stiff running shoes or a cowboy boot or a work boot. Massaging the heel region will break up scar tissue and increase blood to the area to help with healing. Plantar Fasciitis night splints keep the calf and Achilles stretched during sleep allowing for less tension in the morning. A night splint may be used in cases that do not respond to physical therapy, stretching and insole modifications. The goal of the night splint is to keep the calf and Achilles stretched during sleep and rest and allows for less tension and stretching of the fascia those first steps in the morning or after a period of rest. Nonsteroidal anti-inflammatory drugs like Advil can reduce inflammation in the heel and arch of your foot, helping to ease foot pain. One, maybe two cortisone steroid injections may be used to calm the severe swelling and pain. We usually try to avoid these injections, as cortisone is known not only to reduce inflammation (a good thing) but also damage and weaken the tissue (a bad thing), making it more prone to tear. In some cases, we have seen this to be effective and contributed to totally recovery, but usually its effectiveness is temporary. While approximately 80% of our patients respond to simple conservative care, heel pain may continue to be a problem for some. This is often due to a lack of blood flow to the damaged tissue resulting in chronic plantar fascia pain and scar formation. In order to correct such issues, the body needs to be alerted to the injury region so it again begins to treat the damaged tissue and help resolve the problem. Dysport is injected into the calf muscle or plantar fascia, tone and stiffness is reduced. This prevents the nerve from over stimulating the muscle by blocking the link between the two. This allows tight calf muscles to stretch, relax and grow. When Dysport is injected into the plantar fascia, it relaxes and weakens the strength of the tendon, relieving swelling and pain. Dr. Baravarian discusses regenerative medicine therapy for the treatment of plantar fasciitis. Platelet rich plasma (PRP) injections allow growth factors in the blood to be used to cause inflammation of the injured tissue. This increases the healing response of the body. With PRP, the blood is drawn and spun down with a centrifuge. Under ultrasound guidance and local anesthesia, an injection of PRP is placed in the damaged tissue. This sparks an increased growth-factor release in the area, which increases the blood supply to the damaged heel region to facilitate a healing process. During stem cell therapy, the patient's own stem cells are removed by simple blood sample collection. Using a special procedure, unhelpful cells are removed leaving behind the strong healing stem cells. Those cells are injected into the injured area and begin to replicate themselves, making healing possible. Topaz, a minimally invasive procedure uses high frequency energy to spur healing. Topaz coblation technology combines bipolar high-frequency energy with a saline-based medium to remove damaged tissue with little, if any, damage to surrounding, healthy tissue. Removing tissue irritates the fascia enough to turn a chronic problem into an acute problem by increasing circulation to the damaged area. The patient's body then increases the natural healing properties, which begin to repair the newly injured ligament. Doctors use a diagnostic ultrasound to identify the exact site(s) of scar tissue. Using the TenJet probe, the scar tissue is broken up using high pressure streams of water, whereas Tenex uses radio waves. The procedures usually takes only 15 minutes and there is usally just some minor swelling after the procedure. Extracorporeal shockwave therapy is a non-invasive, office procedure that permits new blood flow into the area of fascia damage. It is a long-term solution and there is a slow improvement with maximum pain relief usually at 3 months. However, there’s usually improvement seen at the start of the third week. Surgery is reserved for the most chronic cases of plantar fasciitis that do not respond to conservative or advanced therapies. In those cases, fascia release surgery is used to release the tight fascia. The fascia is cut to relieve tension or pressure from the loss of circulation to tissue or muscle. The surgeons at UFAI have perfected the approach for fascia release. Our endoscopic and minimally invasive fascia release procedure promotes rapid healing with the quickest surgical recovery. The surgeon makes two small incisions on either side of the heel. An endoscope is inserted in one incision to guide the surgeon. A tiny knife is inserted in the other and a portion of the fascia near the heel is removed. Patients typically have 3 weeks of downtime in a boot. The surgeons at UFAI have perfected the approach for fascia release. Our minimally invasive fascia release procedure promotes rapid healing with the quickest surgical recovery. Our physicians are nationally recognized as experts in the treatment of plantar fasciitis. Our results are revolutionary and unmatched in the community; less than 5% of all UFAI patients we see for plantar fascia need surgery and less than 2% need a fascia release. 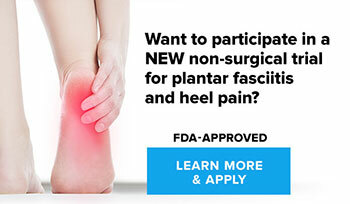 Internationally recognized as experts in the field of plantar fasciitis and heel pain, the specialists at UFAI speak and instruct worldwide on the latest techniques and the most innovative products on the market. They are often asked to share their expertise in various medical publications and to participate in clinical trials, including a new technology, which uses high frequency ultrasound to treat heel muscle injuries. MISDIAGNOSED? When Heel Pain Isn’t Plantar Fasciitis (you’ll want a 2nd opinion after reading this)! Playing Through Pain: Plantar Fasciitis Slows Angels’ Pujols... Again! Heel and Ankle Pain, UFAI's May Free Seminar!